Twenty people were arrested during competing demonstrations by Antifa and individuals connected to the alt-right. Three people were hurt after authorities say "extremists" threw explosives at police officers, Fox News reports. The explosives are believed to have consisted of fireworks and flares. Video posted on Twitter shows individuals dressed in black using hammers to smash windows at the Marine Corps office. Berkeley police said a group of protesters damaged 21 city vehicles and set fire to trash bins. Police also warned protesters prior to Sunday's demonstrations not to wear masks or bring items that could be used as weapons; however, images of the event show at least some people ignored the rules. Last August, Antifa protests in Berkeley similarly turned violent. Video emerged showing Antifa members beating individuals and threatening journalists. A senior researcher at the Anti-Defamation League, Joanna Mendelson, commented at the time that violent action by even a small number of protesters "undermines their entire effort to counter the narrative." House Minority Leader Nancy Pelosi (D., Calif.) condemned Antifa’s actions. "Our democracy has no room for inciting violence or endangering the public, no matter the ideology of those who commit such acts. The violent actions of people calling themselves Antifa in Berkeley this weekend deserve unequivocal condemnation, and the perpetrators should be arrested and prosecuted." Others on the left, such as Democratic National Committee deputy chairman Keith Ellison (Minn.), have been less inclined to separate themselves from the radical leftist movement. In January, Ellison tweeted a photo of himself posing with a copy of the radical left-wing book Antifa: The Anti-Fascist Handbook. 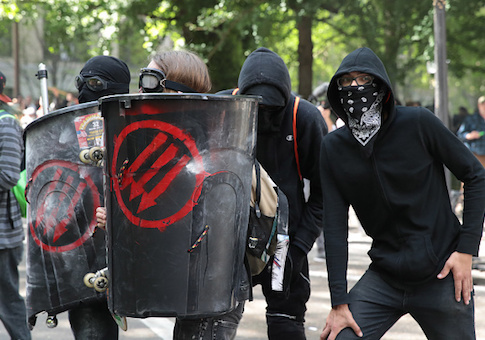 The FBI and Department of Homeland Security have been warning state and local authorities of Antifa’s increasingly violent turn since 2016. DHS classified Antifa’s activities as "domestic terrorist violence" in the final year of the Obama administration. This entry was posted in Politics and tagged Antifa, DHS, FBI, Marines, Protests. Bookmark the permalink.